Click the menu button (line-box) in the upper left hand corner to see how many moms love this curriculum. I have walked with God for over 30 years and experienced His almighty power and provision in my life, yet Cat and Dog Theology opened my eyes to how selfish my love for God truly is. I just needed to take the time to thank you from the bottom of my heart for the Cat and Dog Theology Bible curriculum. It has changed my girl’s lives. My second daughter is Esther. She is 14. When she first started taking it, she hated it. I knew she would because she was just like the cat in the book. And that is what I needed her to realize. After a few months, she realized she was like the cat and decided she didn’t want to stay that way. So she continued doing the study and we continued praying and encouraging her to not give up. Then last weekend, she finally surrendered her life to the Lord. I was so excited at this answer to prayer, that I couldn’t turn off the tears. I have been rejoicing and giving God all the glory. Her countenance just radiates the love of God instead of focusing on herself. Lydia, my third daughter, 13 years old, told me told me yesterday that she has enjoyed watching her older two sisters change so much that, she too can’t wait to start the curriculum next year so she too, can experience God in a selfless way. Blessings to you. I felt compelled to write and tell you how your books have impacted my family. My three daughters (ages 7, 10, & 11 at the time) and I worked through Cat & Dog Attitudes a few years ago. We enjoyed the Good News stories and the girls especially enjoyed the cartoon book! Besides my heart rejoicing at the missionary stories, the girls running to find the countries on the map, and perhaps a second thought on our attitudes/cattitudes, there wasn’t a huge change in our everyday thinking or living. A few years went by and the Lord led us to try your curriculum again. This time, my youngest (10) began Cat and Dog Rewards. What a beautiful gift your work has given to this mother! I have watched, discussed, prayed with, and enjoyed my little girl’s spiritual understanding grow by leaps and bounds! My 8th grade daughter began The Dog Walk at the beginning of her school year. She was quite interested in doing it independently and immediately enjoyed Emma’s Story. In fact, she would tell me the synopsis of each reading segment. It impacted her greatly. Well, a little while went by and I hadn’t heard too much about what she was learning or how things were going in her work, so I decided to sit down and look through the past couple of months of her workbook. Unfortunately, there were skipped questions, zero memorized verses, and some questions answered so quickly that there clearly was not any thought put into them if they were even read correctly. Needless to say I was a bit disappointed (now realizing my lack of involvement/accountability was key). Well, she stopped where she was and focused on memorizing the verses she had skipped. After successfully hiding His Word in her heart, it was decided that we would work through the lessons together. We began on a lesson that was teaching how to S.O.A.K. Wow! It is beautiful! I purchased some small notebooks and now my 10, 13, and 15 year-old daughters and myself S.O.A.K. each day! My 13 year-old is enjoying her Dog Walk and learning from it! And again, doing it together is allowing for some questions to be asked and answered. My 15 year-old told me that she “actually” enjoys S.O.A.K.-ing because it’s personal yet, together. I am now going to pull out our dusty Year One High School Cat & Dog Theology and look through it and possibly begin with my oldest. Your curriculum is growing our spiritual understanding and walk with The Savior. Thank you so much for obeying God’s leading in your curriculum ministry. This mother’s heart is full! Learning and growing in spirit and in truth is what your materials have brought to our lives. May our Lord fill your needs and bless your work for His glory. I had two encounters today in my jail ministry, one from a very strong CAT, and the other from a possible very strong DOG. Both inmates had stories in how their world was crashing in. After hearing about how their world was crashing in around them, it was just natural and I believe Holy Spirit directed to share about being Cat or Dog centered. You should have seen, the inmates eyes open up and even started to cry how freeing they were as they center in on God not self. I also just want to thank the Sjogrens for writing the curriculum. I’ve grown up in a Christian home and have been a Christian myself for almost 3 years, and Cat and Dog Theology has really opened my eyes to the truth of what life is all about and how to live it in the best way: glorifying God. It’s so much easier to do what you know you need to do as a Christian when you realize that it’s about glorifying God, not about paying God back for giving us salvation. Also, the second year, on missions, has given me a passion and direction for serving God in my life. Hello, my name is Devon Hine. I live in Fredericksburg VA and I’m 13 years old. I first heard about Cat and Dog Theology at the homeschool convention 2 years ago in Richmond. I had no other workshops to go to and my mom was waiting for my aunt to meet her so we looked in the schedule and saw your workshop. So we walked in and sat down (not expecting much, just another bible study designed to get teens interested in the Bible). After just a few minutes I realized this was no ordinary Bible study. I realize now it wasn’t just an accident I came to your session, it was part of God’s plan for my life. After the session we went to the curriculum hall right away and bought the set. I am so glad about what God is using you for. Your curriculum completely changed the way I thought, viewed the Bible, and the way I lived! I’m doing the RG3 curriculum this year and I have learned so much. Wow. Chapter 12 is awesome, convicting, moving, mobilizing…to say the least! Chapter 12 helped bring it all home (pun intended), for me at least. Currently I struggle with wishing I could go back and undo some past decisions that were totally and completely driven by worldly thoughts and ideals. I’m finding I beat myself right into stagnation, which isn’t getting anybody anywhere, much less answering the Call to all Christians. After digesting chapter 12, I’m still regretful that I didn’t understand at 18, 28, or 38, but I’m grateful I know at 42 years of age! Halfway through my life I get it! Praise God! (Better than realizing at 82!) That gives me a good forty years, God-willing, to respond to the Calling. Wow. Thank you for answering the Call… so that I could too. I know that for me, after I read Cat and Dog Theology, God gripped my heart and realigned my life from selfishly living for me to intentionally living for His glory and for others to know Him. Hello! My name is Hannah and I am nearly finished with Year 4 of your Cat and Dog Theology curriculum. I wanted to let you know that (in addition to everything else in the books), the Chris and Sarah stories were very powerful and relevant to me this year. I liked how the story dealt with Chris and Sarah’s mom’s death but made it clear that their mom was experiencing great joy in Heaven. Not many books explore Heaven and what it might be like to meet Jesus, so I really enjoyed reading about that part. It also challenged me because I know I fear losing my loved ones – but this has helped me realize that if anything ever happens to them I know I can trust God’s sovereignty. Overall their stories really helped to strengthen my own faith in God. I also appreciated the storyline about human trafficking because it is such a real-life issue. I know it happens (I’m sure close to where I live), but I never realized the details of what is involved and how it happens so subtly. I really appreciate this knowledge because even though it is upsetting, it has given me a better idea of what to watch for and how I might communicate with a victim in the future. I feel like I’m not clueless anymore. Thank you for writing such “real life” stories about how we can give God glory (even in tragedies). I feel like this is not talked about enough and I appreciate the details you added to the Chris and Sarah stories this year that helped me connect with their stories more. I learned so much from them and I am so grateful that you took the time to create them. It has definitely challenged me and inspired me to love God more deeply. I have introduced the cat/dog theology to my son. He can’t keep his hands off of the cartoon book. I can’t believe how he totally understands it. As a parent of my own “Chris” and “Sarah”, I was drawn to this story line from the start. Although we did not use the curriculum as intended (we read the material and answered the questions together), I was thrilled that my teenagers were EXCITED to start the day with Bible study. While the story line was a bit “grown up” for my middle-schooler who was studying along with her high-schooler brother, she appreciated that the Chris and Sarah’s story line was “real life” and not watered down. I hope it was helpful to both in recognizing the dangers potentially facing them online. I will also tell you that we nearly stopped using the book in Year 2 because we are NOT missionaries and didn’t feel that it was a good fit for us….yet continued because we wanted to know what happened to Chris and Sarah. After working through Year 2, we made some decisions as a family and have twice visited and volunteered with a school for children in rural Haiti. During our second trip this April, my son taught a robotics class to about 20 students through an interpreter while my daughter distributed the clothing and supplies she had gathered throughout the previous year to a nearby village in an effort to share the love of Jesus with about 30 children. We still (stubbornly) don’t call ourselves missionaries but are planning our third trip next year. Thank you for making such a dramatic impact in my children’s lives! Find out why so many Christians are self-centered. 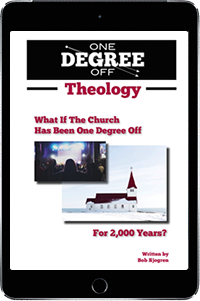 Get the free "One Degree Off Theology" ebook by simply signing up on our email list!